This 1959 Cushman Eagle has life again and can be seen in the Old Gasoline Station at the Oklahoma Territorial Plaza in Perkins Oklahoma USA! 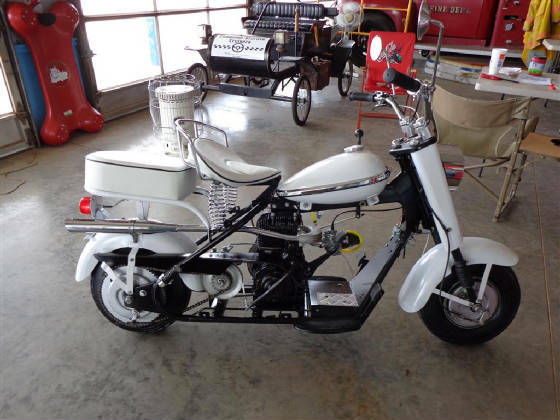 The Cushman Eagle was purchased from Pat Nowotny of Waco Texas in the summer of 2000 as an inoperable scooter for a restoration project by John Dragoo. 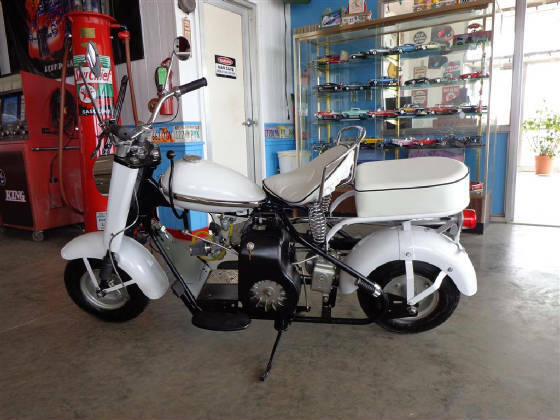 John began purchasing needed parts and made plans for the future of this classic 1950’s American Motor Scooter. After several years the Cushman restoration project was put on the back burner due to John’s love of classic Chevrolets. John decided to replace the engine in his 1955 Chevrolet Del Ray with a new 350 cubic inch crate motor, so he sold the Cushman to Jon Bartram and Shelby Lauener. The classic old scooter just lay dormant until this past November, when Jon Bartram who had never had a Cushman began the restoration project. Bill Scott Body Shop of Perkins Oklahoma sand blasted all the parts. Jon did the disassembly, body work, primer, paint, assembly, parts ordering and became very knowledgeable of the old scooter. By the end of January 2013, Jon had brought the scooter back to an operable state. 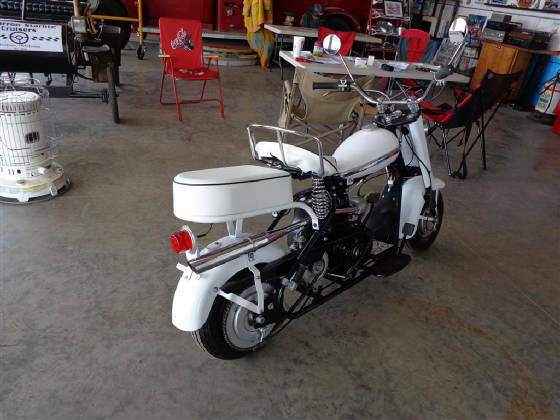 This Cushman has a 318 cubic centimeter Husky motor which produces 8 horsepower and a two speed standard transmission with a throw out bearing centrifugal clutch. 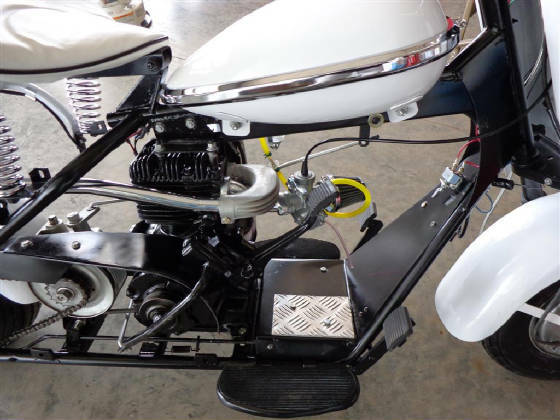 The scooter has a twelve volt magneto electrical system with headlight, tail light, stop light and horn as standard features. 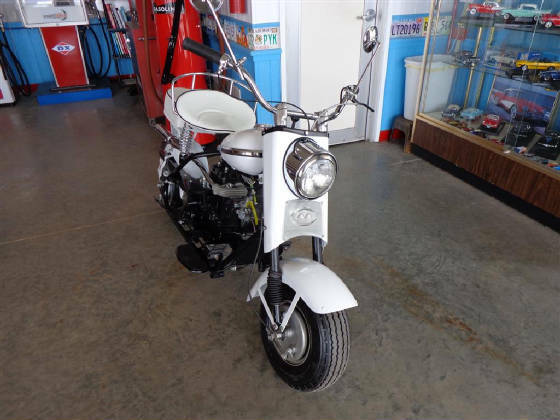 The scooter rides on 4.75 inch X 7.75 inch tires and stops with drum brakes. 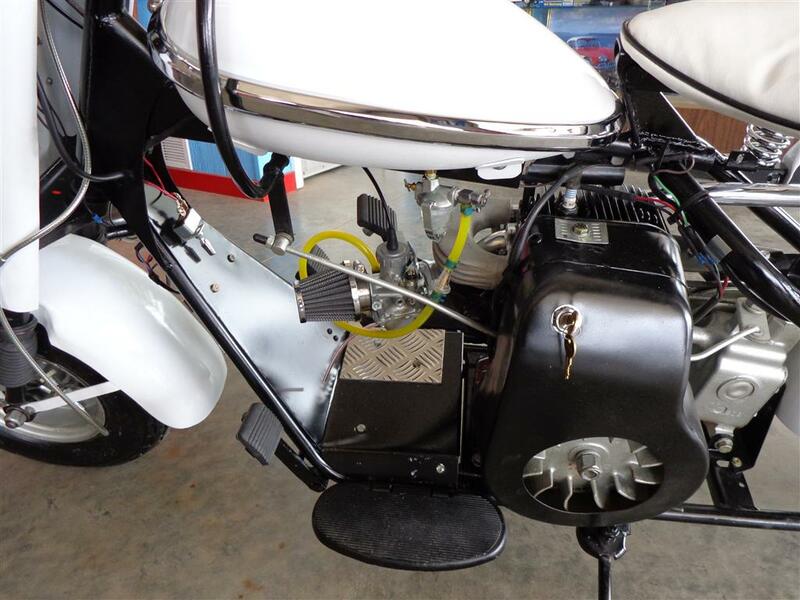 The only change to the scooter was the addition of a modern Mikuni MIK-1 slide carburetor which makes starting and tuning much easier than the stock Cushman carburetor. In February we loaded the scooter on a trailer and moved it to the old station at the Oklahoma Territorial Plaza. Then a problem, the Cushman would not start! The fly wheel was pulled and discovered the contact points were not closing as they should. This situation was fixed and on the fourth kick the old Cushman roared back to life! The local Hagerty Classic Insurance Agent, Lyle Newman of Stillwater was contacted and a policy was acquired for the Classic 1959 Cushman Eagle. This process was very smooth and the verification cards were received in just three days. We would like to thank Tommy Forman and Bob Whitton for helping with the appraisal of the Cushman. 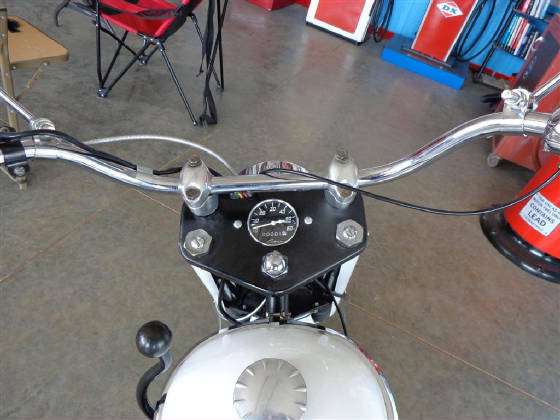 Tommy and Bob have been involved in classic motorcycle restoration for a good many years and their knowledge was extremely helpful. Next a stop at the Perkins Tag Agency and the Classic 1959 Cushman Eagle was legal for the road once again.